If you're in the USA, and want to see how Olympics coverage should be done, consider grabbing this video of the BBC's coverage of the opening ceremonies in three parts. You'll need a Bittorrent client like Azureus to download these, and probably also the DivX video codec. The movie files are quite large -- about 700 Mb per part -- but worth it. I remember in 1980, NBC test broadcast a football game without any announcers. It was the Miami Dolphins vs. the New York Jets. No voiceovers. No play by play. Just the game, and the occasional graphics telling you stats and game positions. It was one of the best games I ever watched. They never did it again. They probably never will. So it's a serious question I have for NBC: why is your coverage so awful? Why are you so afraid of airtime that isn't filled by the chiaccharare-batcheat-chitchat of your chirpy and uninformed magpies? Who is responsible for this? Does your market research show that people would rather listen to your talking heads babble about what we're watching rather than actually listen to the show they tuned in to watch? Do you really think you're going to be able to compete in the global marketplace in 2008, when instead of having to wait all of 24 hours to see the BBC feed, I'll be able to watch it live as it happens? Because if you do, it's time for me to short-sell General Electric. 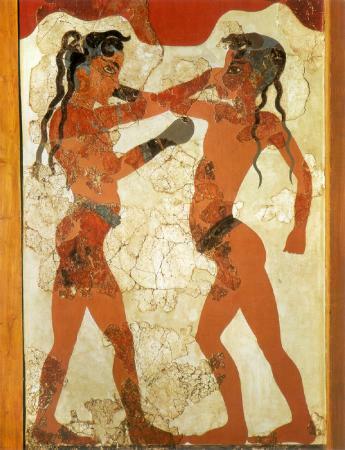 A website with lots of images of Greek art from the Minoan period of the sort you will see in the Opening Ceremonies. Thanks to Stewart Clamen. So I watched the first part of the BBC Opening Ceremony presentation today, which included the artistic portion (not going to bother with parts 2 and 3). The lone announcer (Barry Davies) doing the "play-by-play" sounded pretty erudite, and gave a pretty fluid presentation of the "story" told by the show (from the drummers through to the Olive Tree). I looked him up and was surprised to discover that he is a football announcer. He clearly started with the same script that the NBC and CBC folks were given by the Athens committee, but he gave a clean narrative. I'm not going to theorize on why the BBC Olympics coverage is better than the NBC or CBC one (though I don't doubt it is), since I haven't seen any of it. But in this particular case I think a major part of the problem was having two people there. A solo announcer can present a continuous narration, and not talk when the situation warrants. But if you have two people, when one stops talking, the other will probably feel obliged to fill the dead air. After all, if they weren't going to talk, they wouldn't have been contracted to be there! I absolutely CURSED Katie Couric during the converage of the Athens game opening ceremony. Why ON EARTH did they have to talk about Bjork's swan dress incident that happened so long ago!? They showed no respect for the artist herself and ridiculed the whole ceremony. Those ignorant people should have stayed at home and study geography.